Can't remember my pre-sale password. Can someone tell me what the password requirements have been? This usually helps me remind the password. same here I sent an email to the helpdesk. I hope there is an easy way to recover/bruteforce my password. So I'm trying to bruteforce my password, I know my password is a passphrase, but I don't remember the symbol I used. I tried to generate with crunch a dictionnary but I was not able to set up words instead of caracteres. Do you recommand a program to generate this dictionnary? 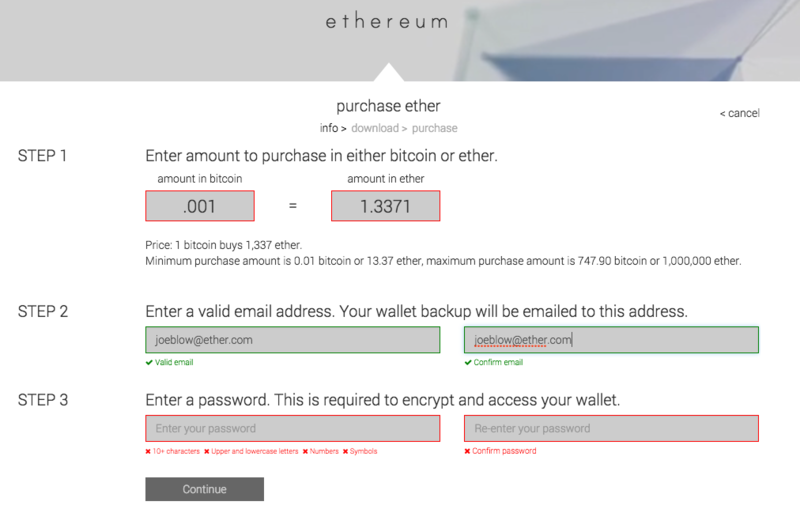 If you need help jogging your memory, you can visit our old sale site at: https://stage.ethereum.org -- this sometimes helps if you have a standard algorithm that you use for generating passwords without a password generator. For brute-force password recovery, you can try using https://github.com/burjorjee/pyethrecover (requires Python and the bitcoin package from python-pip). If you know at least part of your password, you can use this program to automate the testing of permutations of your known password characters (just add them all to a text file). There is a rumor that certain characters are not porting well to frontier geth? is this true? Also, was there a character limit? I believe i used an 85+ character string with every symbol on the keyboard including |\?~ etc. My question still remains unanswered, were there any characters excluded or have current known issues? Thanks for all this stuff guys, I'm now officially in the same boat. But it does not seem that the pyetherrecover does the right thing. I put like ('a','b',...'z','0'...'9'), on each line and then made 10 of these lines. It seems it should take my rather low-end virtual machine more than a few seconds to test all these 36^10 =~ 3.6 quadrillion combinations. An abandoned .json file (with an emptied account) and a known password would be a tremendous help here!! Can somone explain how to used the pyethrecover tool? I have typed the following below into the command line on windows but I get back and error message bellow. I have coppied the pyehtrecover.py file into the python 27 folder but still it cant find the file. p.s. I used the -w and -s option but both have the same error. that isn't even an option..? Have you recovered your password? Was this even meant to work with the keychain? There are very few words on this on the net. Was anybody able to solve this problem? I'm pretty sure I made a typo when creating my password for a Mist wallet. I have spent time fiddling with the code of pyethrecover to no avail. My son has his password but for whatever reason it wont work. worth $400,000.00 now. And I cant find my darn json file worth $700,000.00 I cant believe we are so close to that much money. I'm in the same boat. Been running brute force for almost a month now. We really need an official tool for this. There's a massive community of people who are in the same boat. @StephanTual hi there I stil have problems with my presale wallet. I'm sure about the password but I am afraid I did it with the ipad. Is it possible to check it on the old website? Maybe I can type it and you can check if it has been changed in something else. Please help. have you all recovered your password? OK, I met a great team and they opened it! !